Heston Blumenthal is a chef well known amongst those who are into fine dining. 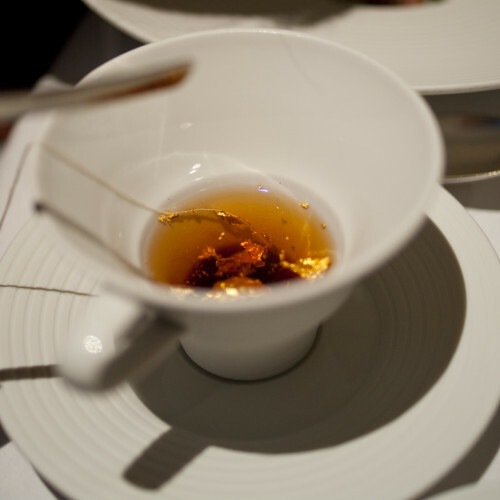 His restaurant “The Fat Duck” has won numerous awards including three Michelin Stars, and Restaurant of the Year. When I say “Restaurant of the Year”, I don’t just mean restaurant of the year in Bray, Berkshire, or even all of the UK. This is a ranking that rates the most highly-regarded restaurants in the world. In this list, it has consistently placed highly, often coming second, and this year slipping to third with the remarkable rise of København restaurant “Noma“. Also often placing highly on this list are Per Se, Tetsuya’s, and Jean Georges, all restaurants that have been mentioned somewhere on this site. I made the journey with the same two friends who I visited Gordon Ramsay’s restaurant with about nine months ago, and while they spent the intervening time getting engaged, I was getting hungry. In the context of timing, the visit was well-placed. I had recently returned from New York (a foodie’s wonder-city) to Heerenveen where I had very nearly cried when presented with the “provided dinner” (a.k.a. boarding house slop) that our building insists on serving to us. Unsurprisingly, I am taking every opportunity possible to escape and the Fat Duck came to the rescue in a timely manner. 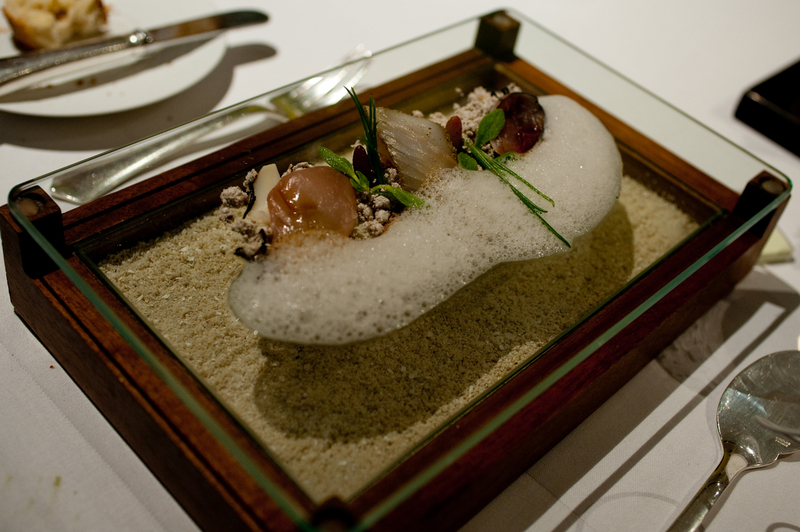 To describe Heston Blumenthal’s creation as a “restaurant” and the dinner service as “food” is to sell it quite short. 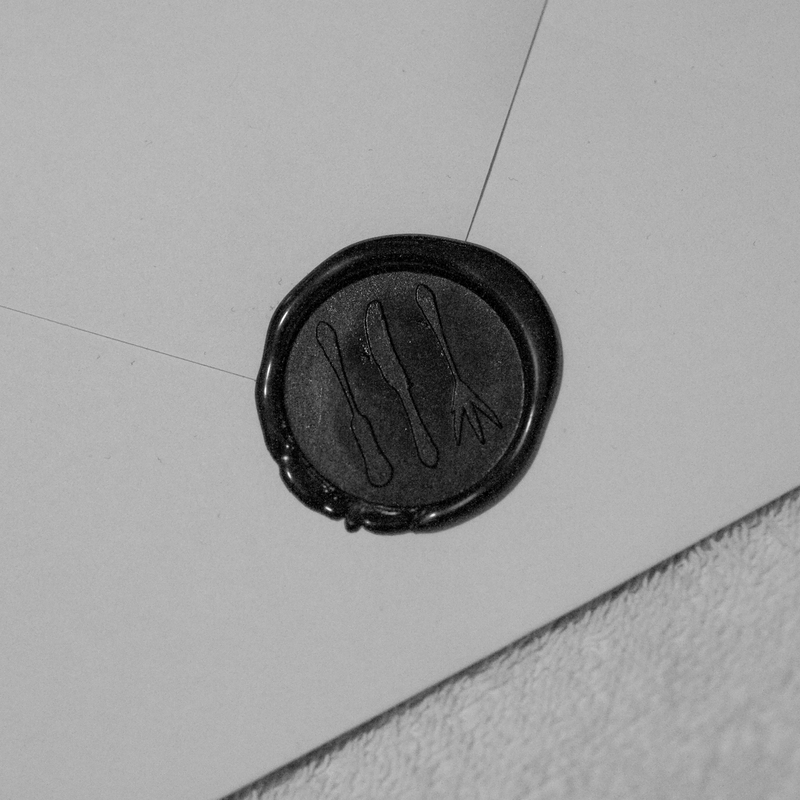 The restaurant is a theater, and the meal is an experience, an adventure even. Someone recently asked me what constitutes “good food”. I responded that truly good food must be an experience which encompasses as many of the senses as possible in a cohesive and immersive (and presumably pleasurable) way. Each scene in Blumenthal’s play on food was distinct, and beautiful in its own way, with many different and varied characters making an appearance, and almost (but not quite) to the point of distracting it from the primary objective – the food. The Fat Duck is one of two restaurants in the world (the other being El Bulli in Spain) that practices what is known as “molecular gastronomy”. All this means is that the process of “cooking” a meal is taken to another level. The ingredients are treated more as parts of an intricate chemistry set. Our appetizing palette cleanser was a case in point. Green tea, lime, and a bit of vodka. Normal so far? Now make it into a foam. Weirded out yet? Now take that foam, and dunk it into a tub of liquid nitrogen to create a frozen foam ball. When brought into contact with a human mouth, after a split second of my-tongue-is-stuck-to-the-freezer sensation, this frozen ball explodes in an icy inferno of refreshing limey green tea goodness. Only the outer shell is really frozen, everything inside is mostly gassy allowing it to travel up to your nose and enhance the flavor sensations experienced by your tongue, with subtle smells experienced by your nose. As an amusing side effect, I also puffed smoke through my nose during my initial bite, indicating a tendency for me to bring my sense of smell to bear when sampling new food. You know a dish is interesting if it has truffles in it and they’re NOT the main thing that stands out about the dish. The truffle toast was merely there to keep the “Jelly of Quail, Crayfish Cream” company. A piece of chicken liver parfait cunningly disguised as ice cream (I’m not kidding) rested upon a carefully layered concoction consisting of crayfish cream on the surface, jelly of quail in the middle, and pea puree at the bottom. The combination was an interesting one, and quite overpowering. The preparation of the jelly caused it to dissolve in your mouth and “sneak” up towards your nostrils in a manner similar to wasabi, except instead of a mustardy kick, this one came with a cool, refreshing assault on my sense of smell. Alice in Wonderland was written by Lewis Carroll, a pot-smoking mathematician from Oxford. Even he would never have dreamed of Blumenthal’s take on “turtle soup”. 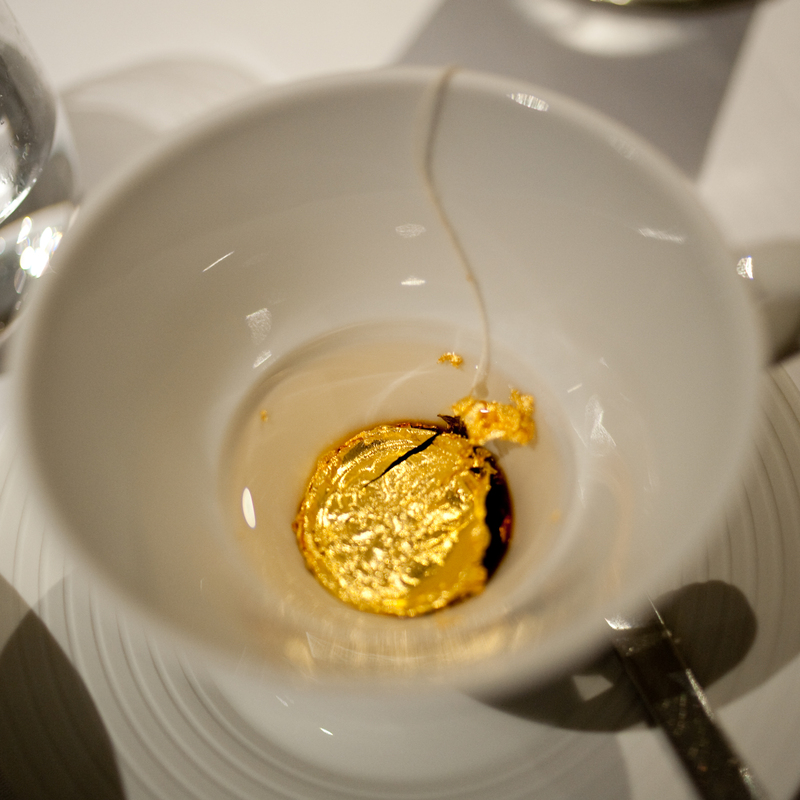 We were presented with what looked like pocket watches (actually, they looked more like chocolate coins with a chain attached) which we were instructed to dip into some hot water and stir. Rather like dipping a watch in a cup of tea – OOOOOOOooooohhhhhhh!!!! The watch promptly dissolved and turned our hot water into turtle soup with gold leaf, which we then poured into our bowls filled with jiggly stuff. Taste-wise, this was less spectacular than the other courses, but it gets full marks for artistic impression. Though I was sad to finish that course, and its complex yet strongly themed combination of tastes, smells (and sounds), our next course was also (mostly) seafood. I wouldn’t have picked it just by looking at the dish, but it was salmon, one of my favorite fish. Keeping it company on the plate were bits of grapefruit mixed with olive oil (no, really, it worked!) 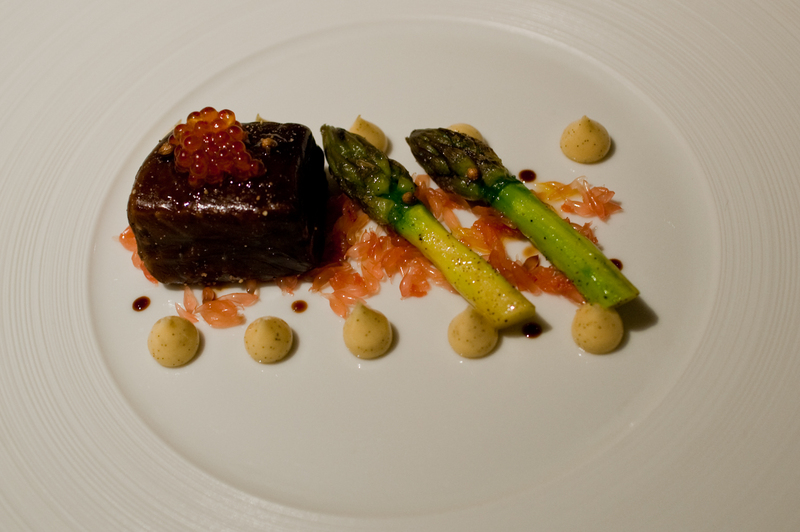 with asparagus, vanilla mayonnaise, and fish eggs. Strange a combination as this was, it was beautiful. The liquorice that the salmon was poached in was, thankfully, not overpowering. In fact, I wouldn’t even call it an aftertaste… more like, an afterthought. 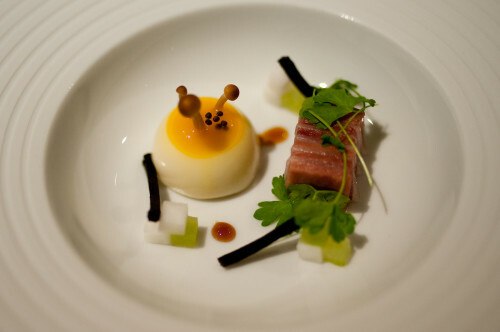 would you believe… salmon poached in liquorice? Something that struck me, was that the dishes were all stunningly well executed. Of course, you expect that at a restaurant of this caliber, but it is often too easy to get distracted by the exotic ingredients and preparation methods (liquid nitrogen? really?) and forget about the simple things. The salmon is a case in point, it was perfectly cooked and just a little rare on the inside allowing it to be juicy and the bring out the very best of the salmon flavor. Throughout the meal, whenever each new dish was presented, there always seemed a bit of a danger that it would be too gimmicky, and that there wasn’t enough emphasis placed on how it actually would taste. Every time, I would cautiously bite into whatever it was, and be relieved. Some of the dishes are a little bit intense, or overwhelming with regards to the taste. In fact, it was the simpler dishes (like the snail porridge) that were regarded as the best. 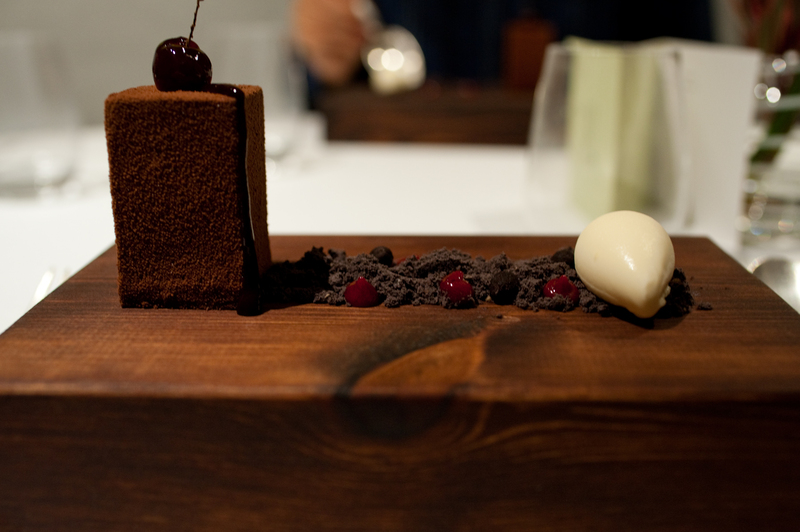 The desserts especially were awe-inspiring in that they were simple, or that their complexity was not overt but much more subtle. The black forest gateau for example was topped with a cherry… except that it wasn’t a cherry, but was simply made to look like one and tasted like one, except stronger (I must sound insane right about now). The telltale sign was that the stem was not a real cherry stem in that it did not attach to the cherry in the way that a stem should. Anyone who has ever accompanied me on a long train trip will know that I’m a big fan of wine gums. 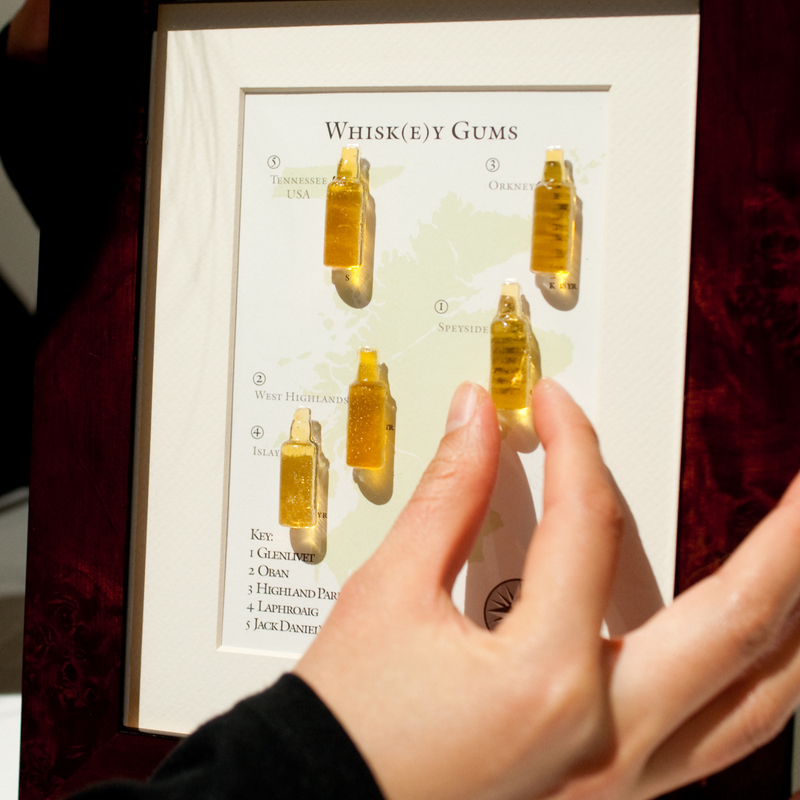 The Fat Duck takes this concept a step further with Whiskey Gums. Then they take it a step even further by making whiskey gums that are distinctive to different scotch-producing regions. Tasting these different flavor sensations and the way that some of them were smoky, while others tickled your tongue was a nice way to wind down. Bray, Berkshire is a short drive from Maidenhead train station which is a non-trivial (about ten pound) train trip from Paddington train station in London. Apparently “small villages are big” in England… according to Joan, who I think meant to say that putting things like this in small villages instead of more obvious and convenient places (like central London) is fashionable these days. Nearly an hour of traveling each way almost demands a good reason for the trip (nevermind the 200 euro 8-hour train transit from Heerenveen, the Netherlands to London St Pancras station). Was it worth it? Yes. The verdict? Heston is a name I have only ever encountered as a last name, as in Charlton Heston. Mr Blumenthal uses it as a first name. His name however is not the first and last name you need to know in the restauranting business. 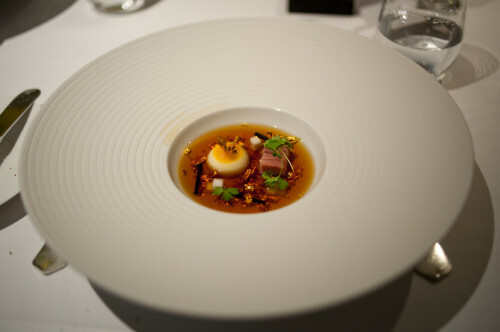 Although the circumstances of my trip to Per Se by Thomas Keller were not typical, thereby making the comparison slightly unfair, the New York Restaurant retains its place at the top of my own restaurant ranking, despite every other professional published restaurant ranking list disagreeing with me. The approaches are very different, and in a paradoxical way reflect different American and British approaches to food. Per Se is situated on the 4th floor of the Time Warner building overlooking Columbus Circle and Central Park, while Fat Duck is in Bray, Berkshire… a town that I would struggle to find on a map (and we struggled to find the restaurant for a few minutes, despite being dropped off within 10 meters of it!). 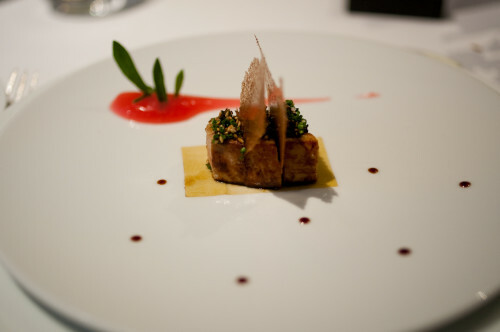 But in the end, it is about the food, and both… in fact all of my Michelin 3-star experiences are extraordinarily exemplary examples of fine dining, and the very best food that I have ever eaten (and I’ve eaten a LOT of food). I would rank it above Gordon Ramsay’s restaurant, although that was not a unanimous assessment of my dining group. I rate innovation and strong tastes delivered to the palette in varied ways very highly. 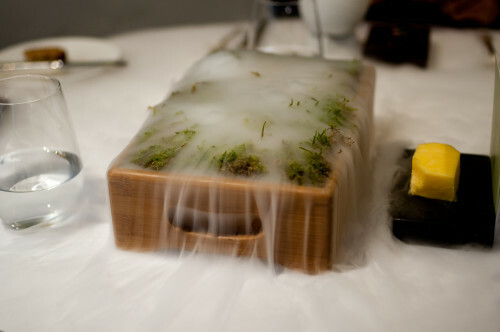 I can definitely see what all the fuss is about regarding the molecular gastronomy, and the copious use of unusual techniques and ingredient combinations definitely adds to the experience more than it detracts. But when you’ve stripped all of that away, gotten rid of all the distraction, and focus on the food, you’ve still got one of the very best restaurants in the world. Not my top pick, but very close to it. When you consider that the food at The Fat Duck may have been designed by Heston but is most often prepared by young chefs who work for the experience and no money(I really mean NO money) for extremely long hours in a very small kitchen or who do “prep” in a shed, the amazing level achieved is nothing short of miraculous and those chefs who really do the work should be applauded. Really? I always thought that being an underling chef at The Fat Duck was a pretty good gig. I also understand that at places like that, the kitchen is actually reasonably big. The standard setup is 5 stations, with two chefs each – a senior one and a second. Those kitchens are more like high-tech assembly plants than places of food preparation. Just fell over this article. Generally good. However, if you aim to be a critic, trying to persuade the web with the quality of your senses, experience, information and education at least try to be accurate. Lewis Carroll was professor at Oxford University (UK), more precisely, Christ Church College and not Cambridge (UK). thanks for the feedback. I have corrected the error, and am frankly a bit embarrassed about it being both a big fan of Carroll, as well as a mathematician. I hope the error did not detract too greatly from your experience of the article.